Select darts game here then press start. Select players on the left half of the screen. All available players are in the left column. You can add new name by tappling '+' and remove existing by tapping '-'. Exit from delete mode by tapping anywhere else. Tap on a name in the left column to select this player for the game. If you like to change game parameters you can do it on the right halft of the screen. 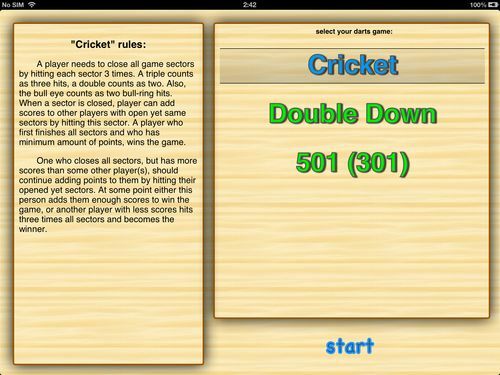 Select one of the predefined sets for game sectors (Cricket and Double Down). Or you can define totally custom sectors and store it to any one of the presets. Preset buttons turn red when you start making this indicating that now they are to store your changes. If you don't want to save, just tap 'default'. Current player is highlighted. 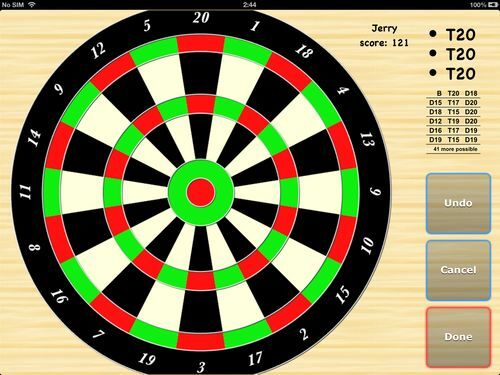 Tap anywhere on the table to open darts board. If you made a mistake, or, if you want to see your score on previous turns, just tap 'undo' button. 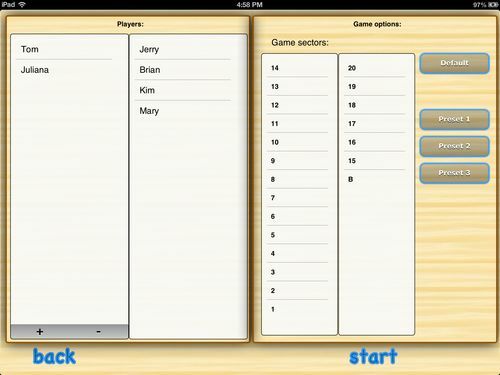 Navigate through the game history using 'undo' and 'redo' buttons. Tap sectors you hit. Tap 'undo' to correct or 'cancel' to close board without saving. 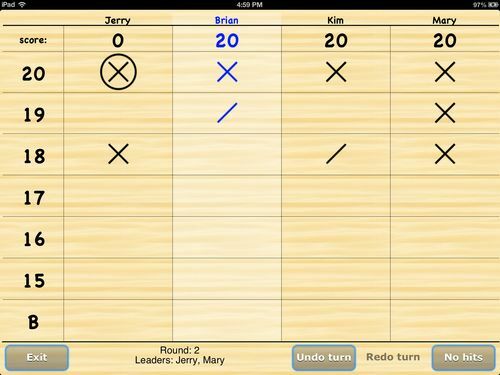 Tap 'done' to update the score and highlight next turn player. Note: x01 game checkouts table is available only in landscape device orientation so far. Thanks for reading! Have fun!